Sergeant First Class Elmelindo Rodrigues Smith (27 July 1935 - 16 February 1967) was a U.S. Army soldier who was posthumously awarded the Medal of Honor for his actions in the Vietnam War. Elmelindo Rodrigues Smith, an American of Hispanic/Asian-Pacific American descent (his Hispanic blood being precisely of Puerto Rican origin), was born in Wahiawā a town located in the center of Oahu Island in the County of Honolulu, HI. There he received his primary and secondary education. He joined the U.S. Army in 1953 and was stationed in various countries overseas, including Okinawa. During his stay in Okinawa, he met Jane, a Hawaiian-born member of the Women's Army Corps; soon thereafter, they married. They established their home in a military post at Tacoma, WA, and had two daughters, Kathleen and Pamela. 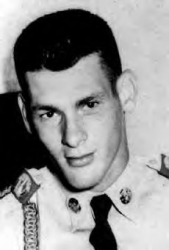 Smith was sent to the Republic of Vietnam on 23 July 1966, and served as Platoon Sergeant of the 1st Platoon, Company C, 2d Battalion, 8th Infantry of the 4th Infantry Division. The division conducted combat operations in the western Central Highlands along the border between Cambodia and Vietnam. The division experienced intense combat against North Vietnamese Army (NVA) regular forces in the mountains surrounding an area called Kontum. On 16 February 1967, Sergeant Smith was leading his platoon in a reconnaissance patrol, when suddenly it came under attack from NVA forces with machinegun, mortar and rocket fire. Despite the fact that he was wounded, he coordinated a counterattack by positioning his men and distributing ammunition. He was struck by a rocket, but continued to expose himself in order to direct his men's fire upon the approaching enemy. Even though he perished from his wounds, his actions resulted in the defeat of the enemy. For his heroic actions, he was posthumously awarded the Medal of Honor. 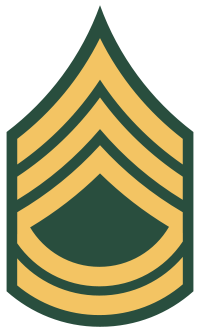 Rank and organization: Sergeant First Class (then S/Sgt. ), U.S. Army, 1st Platoon, Company C, 2d Battalion, 8th Infantry, 4th Infantry Division. Place and date: Republic of Vietnam, 16 February 1967. Entered service at: Honolulu, HI. Born: 27 July 1935, Honolulu, HI. Citation: For conspicuous gallantry and intrepidity at the risk of his life above and beyond the call of duty. During a reconnaissance patrol. his platoon was suddenly engaged by intense machinegun fire hemming in the platoon on 3 sides. A defensive perimeter was hastily established, but the enemy added mortar and rocket fire to the deadly fusillade and assaulted the position from several directions. With complete disregard for his safety, P/Sgt. Smith moved through the deadly fire along the defensive line, positioning soldiers, distributing ammunition and encouraging his men to repeal the enemy attack. Struck to the ground by enemy fire which caused a severe shoulder wound, he regained his feet, killed the enemy soldier and continued to move about the perimeter. He was again wounded in the shoulder and stomach but continued moving on his knees to assist in the defense. Noting the enemy massing at a weakened point on the perimeter, he crawled into the open and poured deadly fire into the enemy ranks. As he crawled on, he was struck by a rocket. Moments later, he regained consciousness, and drawing on his fast dwindling strength, continued to crawl from man to man. When he could move no farther, he chose to remain in the open where he could alert the perimeter to the approaching enemy. P/Sgt. Smith perished, never relenting in his determined effort against the enemy. The valorous acts and heroic leadership of this outstanding soldier inspired those remaining members of his platoon to beat back the enemy assaults. P/Sgt. Smith's gallant actions were in keeping with the highest traditions of the U.S. Army and they reflect great credit upon him and the Armed Forces of his country. Sergeant First Class Elmelindo Rodrigues Smith's family was presented with his Medal of Honor by Secretary of the Army Stanley R. Resor because President Lyndon B. Johnson was ill at the time. However, after the ceremony, which was held at the White House, the family which included his widow Jane, and two daughters, Kathleen 10 and Pamela 6, were taken to President Johnson's bedroom to meet the president. The name Elmelindo Rodrigues Smith is inscribed on Panel 15E - Line 51. Sergeant First Class Elmelindo Rodrigues Smith's was killed in action on 16 February 1967. He is buried at the National Memorial Cemetery of the Pacific in Honolulu, HI, in Section W, Grave 131.